The Mets demotion of Travis d’Arnaud has created quite the stir within the organization. While the organization believes the demotion will allow d’Arnaud to work on his swing, he’s hitting .180 this season, the bigger issue is the current state of the Mets catching. 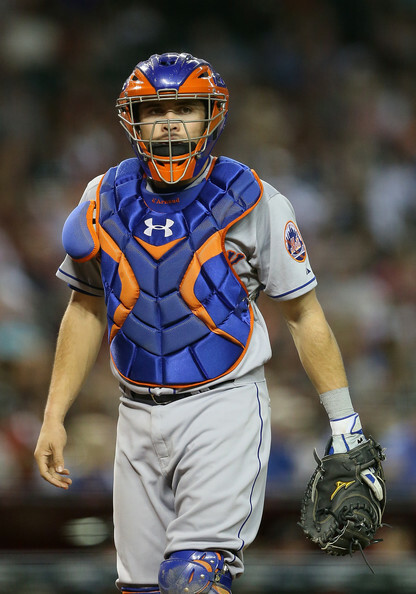 There is no question that d’Arnaud has struggled at the plate, by what Mets player hasn’t? His value to the team has been his ability to handle the young pitching staff and his solid defense. When he was the centerpiece for the R.A. Dickey trade d’Arnaud was hyped for his bat. Despite being disappointing in that regard, his catching ability has helped the Mets pitching staff be one of the best in the majors in 2014. If anything he needs time in the majors to work on his hitting and see more major league pitching. Right now d’Arnaud is the Mets best option. Anthony Recker has struggled mightily in a starting role and has been better suited or a backup role. Taylor Teagarden? Barely an acceptable backup in the majors. With no other prospects even close to the major league level or any cheap replacements on the market, it will be better for the Mets to keep d’Arnuad in the majors. Not only to appease the other players, but to allow d’Arnaud to keep developing. With the Mets recent “mishandling” of Ike Davis fresh in the minds of Mets fans, one can only hope that the Mets have not mishandled this situation.